To review: this is 2/8 tencel, sett 24 epi and is threaded in a 12 shaft M's and W's. The treadling is a bit more complex than the threading as I did runs to and fro and one repeat was approximately five inches in length. I hunkered down and wove carefully as it was easy to lose your place. I did this once and had to 'un-weave' back known starting place.... almost four inches back! I did develop a rhythm in time and soon it was done. Twisting the ends took two full afternoons as there is a lot of fringe here. Once complete, off the board and now comes the bead stash bag. The red in this shawl is more of a brick red and if I was to use red beads, they had to be the right shade and happily I had one bead that matched! Here it is prior to wet finishing and everything is a bit stiff. Washing really settles all your work into it's place and completes the look you want. Same as the huck lace shawl, I soaked it in warm soapy water for 20 minutes and gently squeezed it through, rinsed, then spun it out in the machine. I hung it over a pvc road to dry after pulling it into shape and untangling the fringe bouts. The next morning I gave it a hard pressing using steam and the shine popped out and the tencel turned to 'butter'. The fringe swayed and the beads relaxed. All I need to do now is to trim the ends of the fringes. This I do by laying the shawl on a table with a cutting mat under the fringe. Straighten all fringe, lay a yard stick across the cutting line and roll through with a rotary cutter. It gives a wonderful sharp line. So here is the shawl draped on my studio manikin and pinned to hold it up! Gotta get some arms..
Now, I'm aware that this shawl has an unusual look to it and may not be for every one's taste. The inspiration for this shawl was the work of Inge Dam. 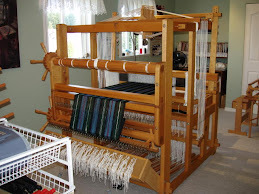 Inge is a Ontario Handweavers and Spinners Guild 'Master Weaver'. Inge did her thesis work on the ancient textiles found in the burial sites in northern Europe. These ancient weavers wove using tablet or card weaving sewn onto their clothing or in some cases actually woven along with their cloth on their warp weighted looms. These bands were much more than methods to tie their clothing to the body, they were adornments and decoration. Inge has incorporated card weaving into her cloth in bright, modern and unique pieces. I would love to show you her weaving here but I hesitate to 'borrow' her images and so ask you to visit and view her work here. I hope to one day try this method for myself, but in the mean time this shawl gives the appearance of bands while being loom woven. As for wearing it, I see a simple black dress with a Celtic style necklace. Or for the really brave, a simple but stunning brick red dress. I have always had a love of archeology and in particular ancient textiles. I have a number of books on this topic but here is one that features burial garments found in graves in Greenland. The title is 'Woven into the Earth' by Else Ostergard. The Viking descendants found here had no trees to make coffins, so they buried their dead in wrappings of clothes. Most likely older clothing and not their best. The conditions preserved the cloth and they were found with tree roots growing down through them, hence the title. So when you sit at your loom, what ever style, do you think on weavers that came before? Each thread is a link to our collective past. Fresh today, hellebore.... and for some reason the white plant didn't come up this year. No sign of my trillium yet..
A shrub by our front door... sorry, don't know its name. Snow drops... they are so sweet. ...other critters! This trail is their path in and out of the water. Looks like we have Otters. Now they will be hard to catch with the camera. This is hubby planting some early seeds or bulbs. Okay, how does your spring look where you are? Ta da! Ready for a close up? I love the sheen and silky drape that come with tencel. If you haven't tried tencel, try some of the cheaper undyed. It runs about $15 for a whole pound! By the way my next manikin is going to have arms since I like to weave shawls. I'll be keeping my eyes open for one next Okanagan trip as there is a used fixture store I like to visit there. So let's back up a bit... the weaving went well and below is a picture of the shawl mid way. Notice the blue bow on the right hand side. I measure from point to point and keep a running tally on a sheet. I find a tape or pins too annoying while I weave but a slip of soft yarn is just fine. I'm methodical enough to keep a running count so it works for me. The centre handle on the Louet Spring makes a neat shuttle rest. Sorry this second picture is dark but you should be able to see the effect across the shawl. It added a 'softer' touch to what is a very feminine garment. I'm a huge proponent of not rushing the finishing. In fact it should take as much care and attention as planning the project did in the first place. Why go to all the trouble to weave and then cut corners at the end? Then I dug out my bead stash bag and settled on three sizes of beads. One is a regular seed bead but has an opalescent quality, the larger one looks like a mini pearl and the the third is a mini seed bead.I start sewing but quickly realize that due to the fancy fringe twisting, the beads won't float to and fro and be seen from both sides when worn. So this means doing a row of beads on both sides, on both ends. Oh, well... better get busy. Here is the 'raw' cloth with one side beaded. You can see how open the plain weave areas look. I crossed my fingers and pressed on. Here is a close up of two rows and after washing/ pressing. The plain weave closed up! YEAHHH! I threaded my beading needle and pushing through the actual tencel, I sewed beads on the cinch points of the Danish Medallions, all three rows and worked front and back at the same time. I used the opalescent mini seed beads. Some kind of silly huh? Can you see them? They are there! They add a sparkle. I pressed it when dry, using steam and the sheen popped out! I fell in love and couldn't stop fondling it. I think Ms. Hammel did a great job in designing this lace! I'll be using this draft again... I hemmed the tray cloth and it looks fabulous too. There is a single row of lace that I brought the hem line up to and blind stitched. Beyond that is a single row of Danish Medallion and the lace blocks after that. The turn under isn't as obvious as this picture shows. I guess the camera flash caught it just right. I'm really pleased with how this turned out and for some reason see it as a bridal shawl. Someone will feel special wearing this.... I loved making it! It sure is nice to have my laptop back and things reasonably set up again. Oh, there are email addresses that are 'gone' ( sorry Peg) and it will take time to restore all the little details that personalize a computer. That was a very long month and during that time so much happened here. I'll share it all but you have all been very patient waiting for something weaving related so I'll start on the lace shawl. The shawl is one of two that I planned to weave for the Victoria Retreat at the Oceanside Hotel in Cowichan Bay on April 3rd and 4th. I thought I would make a start on them early and be finished in plenty of time. It's a good thing I did given the home reno's that happened here. Today will be the first of two posts on this huck lace shawl. Below is the tencel warp being spread in the built in raddle on the Spring "Lilibet" It is 10/2 undyed tencel and this yarn came some years ago from Textura Trading. The various sett guides I have to hand here all say 18 epi for lace, 20 for plain weave and 24 for twills. I thought 18 epi sounded way too open and so went for 20 epi. Even that looked too loose and I did consider resleying to 22 at one point but held my breath and went for the 20. This particular 8 shaft huck lace pattern came from a Complex Weavers' compilation CD and was designed by Christina Hammel. I'm doing that from memory as my Fiberworks program is still not set up again to double check. (I'll edit a correction later if it's not.) I also have yet to work out how to import a weaving draft to here for posting. Got to learn that soon. It sure does roll on smoothly. A real treat actually. Here the threading is under way for 6 lace blocks and plain weave over 8 shafts. I decided to have only half inch plain weave borders as I wanted the emphasis to be on the lace. Sleying all completed at the agonized over 20 epi. Here is the start of the shawl. Notice how open it looks and you'll understand why I considered resleying. I wove some small blocks of lace and then did three alternating rows of Danish Medallions. That was actually a fun thing to work with and good practise! Then I started on the lace repeats and then the weaving simply became a wonderful process as I found the 'zone'. What also helped was my new ipod and I listened to music as I wove. The inches flew by! What also helped was no floating selvedges to watch and no temple to shift. I used my end feed shuttle and the edges just took care of themselves. Over the days I wove off roughly 80 inches not including the borders and left warp of 16 inches for long fringes at either end. The warp length was only for the one shawl but somehow I had added a bit too much of 'something' as there was a lot of warp left. Too much for just samples and so I wove off a small tray cloth as well. A much welcome addition to the sale box. But to be truthful, it's so pretty I may just keep it for myself if I can find the perfect spot for it in the house. I go the iPod Classic by using my Airmiles points. It will hold 30,000 songs when full in 120 gigs of space. That's larger than the computer I'm using right now! I also got a player/ radio docking station so I have more options and can recharge it faster. I might be a late comer to this technology but I'm glad I found it. I still recall the large bulky walkman's of the 80's and we thought we were so cutting edge then. Quite funny actually.... I'll be downloading Weavecast podcasts once I learn the ropes on how to do that. One of the main reasons for getting the player actually. Incidently it will hold pictures, entire e-books and videos... probably a movie too. Amazing. So next post will show the shawl off loom and finishing techniques that I used. It feels good to be back and thanks for hanging in there!